A couple of weeks ago I had the pleasure to talk with Noura Tafeche, PR Officer of the Palestinian Pavilion at EXPO 2015, a little bit about their exhibition and the homeland of her father. She was born in Milan, with Palestinian and Italian origins, graduated in New Technologies at the Art Academy of Brera in Milan. With a particular love for the world’s cultures and its alphabets. She is passionate about soul music, street culture and in particular graffiti and illustration – all areas within which she works. Pascal: Let’s start with a question on Palestine, how did Palestine become part of this years EXPO? Nura: Actually I’m not sure, how Palestine attended EXPO. I don’t know if the chicken was born before the egg, meaning I don’t know if EXPO approached Palestine or Palestine proposed itself to the EXPO. Still we had a chance to have a small pavilion, because Palestine wasn’t able to afford its own big pavilion, a self-built pavilion, so EXPO decided to put Palestine into the Arid-Zone Cluster, which is completely inappropriate. Nura: First of all because Palestine is not an Arid-Zone. I mean, a small percentage of Palestine are arid, which is the desert of Naqab, which belongs to Palestine, like the whole area of the “so called” Israel in my opinion and not just mine but all the Palestinian people’s. So the desert of Naqab for example, which is the only part of the Arid-Zone, now ironically belonging to Israel. So it’s nonsense to call us an Arid-Zone, because if politics and hypocrisy sees Palestine as an Arid-Zone, it would mean that she has to owe the Naqab desert. Pascal: Arid just means actually that there is nothing – kind of insulting isn’t it? Nura: Definitely, also if you look into some vocabulary or dictionary, you are going to find just bad synonyms to “arid”, as it means something that is infertile, something which is not developing in any way and it’s getting worse, worse and worst. So it’s completely meaningless and I do believe that it is a political choice. I mean it’s not made by chance. No there is a political reason why. Pascal: Besides that do you think the other pavilions in this cluster fit the profile, or you fit among the other pavilions? Nura: No, I don’t really think that. The only thing that we share with the other pavilions is struggle, is that we have a real independence history, just talk about Eritrea, how much they fight against Ethiopia, or how much Somalia is fighting against something else – that by the way – could be due to inner or outer political matters. Still we are not talking about geopolitical views, but the thing is, we are collected altogether, just because we are left quite apart from the rest, because we have a really strong story to tell. Because we are fighting against injustice. Nura: Well, but I mean that’s my point of view, that’s my point of view. Pascal: Why aren’t you allowed to raise political topics or you just don’t want to? Nura: Actually it depends on what does “political” mean, first of all. In my personal opinion “political” means something completely grassroots that has no form of government or no form of parties. “Political” means starting from the ground, from the self-managed communities and so on, government and parties are not political, they have corruption sometimes. The thing is that I don’t want to talk about Hamas and Fatah, because I don’t care about them. I mean, I was born and raised in Italy first of all, and so I’m not getting myself in political issues that I can not even understand, because I’m not living in Palestine 24 hours. So I am no one to judge the political choice of Hamas, Fatah and so on. So the topics that I want to speak about, when people come to the pavilion, are first of all cultural, historical, artistic, literature – cultural heritage, because I always said that whenever you would like to bury the culture and identity of someone else, some country, just tear down – its art, its history, its literature, its poetry and so on. Just leave them with war and nothing else to talk about, so embroidery, or food, or poetry, or artists… if we are not talking about them, for sure people are going to forget Palestine. Pascal: So you’re referring to Palestine actually, by saying that those things got destroyed. Nura: Yes, I do really believe a lot in arts, without arts for me it’s quite difficult to storytell a country, to storytell people, many people and all the anthropological differences. Pascal: Do you think that your pavilion kind of helps an understanding of Palestine and broaden the knowledge of people that there is actually a state bordered by Israel, who still exists and has a long-lasting history? -“Ah, I’ve been there for a pilgrimage”, and as much as we know pilgrimage is just an Israeli point of view. Pascal: But you have been to Palestine last year, is that right? Pascal: And for the first time? Nura: Si, in my life, yes. Pascal: Tell me about that. Nura: Sure of course this kind of thing changes your life forever, first of all, because it’s the land of your father, in my case it’s my father, heritage, and so I could experience for real, first of all the experience of travelling, because I had the luck of being born free. So I have the right to move wherever I want, because I was born really lucky, highly lucky and so I had the chance to go to my fathers homeland and I saw all the things that I already knew about Palestine, which is one of the biggest cradles of culture in our world, especially from the Western point of view. Palestine has so many things, I’ve been completely – I mean – I’m quite indifferent towards their religion and the spiritual topic. Pascal: You are Christian, right? Nura: No. I don’t care about religion. Nura: I do believe – I could believe in god, but it’s a really personal thing and I keep it quite private – a privacy thing. Pascal: Would you say it is a religious war going on, between those countries? Nura: It’s just an excuse, it’s just an excuse to help people to create more alibi and differences but religion has nothing to do with the real war. Ok, it could be, but in my opinion it is a total fake and a total excuse. Whenever you are trying to invade illegally or legally a place which is not yours, means that you have more than one reason above religion, because – if it could be just about religion – it’s just an instrument to put confusion in the minds of people. Because everyone likes to be affected by religion, so this helps more the common senses. Pascal: So what can I, as a plain observer, learn inside the Palestine pavilion? What does it lack? Nura: Our pavilion is small, very tiny, we have a restaurant and this restaurant has a big fame of being one of the most delicious of EXPO fortunately, because the chefs are really working hard to push the gastronomical culture of Palestine. So they are doing a really great job through food, because EXPO is supposed to be about feeding, as they like to say and they are really demonstrating and showing, how rooted our gastronomical culture is. The second thing is that whenever you are coming to the pavilion, unfortunately you are going to see a lot of souvenirs, too many in my opinion, because it seems like a small bazaar for tourists sometimes in Bethlehem for example. Pascal: But that’s a problem of many pavilions. Nura: There is too many things to sell there, is too many things to buy and there are too many crosses it’s too much Christian oriented, but the reason is- not because we are going to hide anything about Palestine, the religious differences, no – simply because a lot of strict believers maybe coming from France, or Spain or Italy, they are rather understanding crosses and Jesus Christ, than Allah or something else. So they are going to buy more things concerning Christianity. Pascal: I don’t know, is there such a huge Christian part of the Palestine people too? Nura: The Kofiah? Yeah. Actually the Kofiah is the symbol of the Fellaheen, which are the farmers, the real fighters, since the beginning. Then later Arafat and Leila Khaled, which were two big revolutionaries in Palestine, adapted the Kofiah like a human rights symbol. Ok – the thing is that Palestine is 60 percent muslim, talking about percentage, but I’m not sure about the percentage, so if you would like to have a real statistic, better go study in a book. Nura: Either way, there is a really small minority of Christian, Jewish, Russian Orthodox and non-believers. Non-Believers as well. Nura: Si, like me, even if I was born and raised in Italy, simply a child of the Diaspora. Still my father is a quite unique man, because he’s one of few of the people raised in Palestine through the war, who became refugees. In my opinion and my experiences it’s quite hard to find someone like my father. Pascal: Would you like to tell me something about your father? Nura: Si. My father is a person that I esteem too much. A real example to me. First of all, because he is completely befriend with my aunties and uncles, he’s the only one who got married to a really young, younger than him, woman in a foreign country, he started to study medicine, he wanted to be a doctor, but unfortunately he couldn’t get the last two exams due to job issues or time issues, and because he is a really non-believer in religion and this allows me to be completely free about this and I owe him everything. I owe everything to my mom as well, but my father – year by year I do understand that he’s a unique person, completely unique. Pascal: Did he flee out of Palestine, or did he migrate? Nura: Yeah, he fled, he has been evicted by his home in Safad, by the settlers, by the war, by Israelis – in 1948 when the occupation started. So his home, our home in Safad now is completely occupied by settlers and he has no right to come back, because once you start to be a refugee it’s too hard to come back. Then he went to Libanon and Damaskus, Syria, Saudi Arabia and on and on, and then he moved to Italy and he spend his whole life in Italy, after. Actually he gained the citizenship, the Italian citizenship like six or seven years ago. But those are political things, we all know how narrow minded bureaucrats are about these kind of things. Pascal: Yeah. Let’s stick to that and talk about the political side of EXPO a little bit, because I don’t feel that there are actually many political topics discussed at this EXPO. 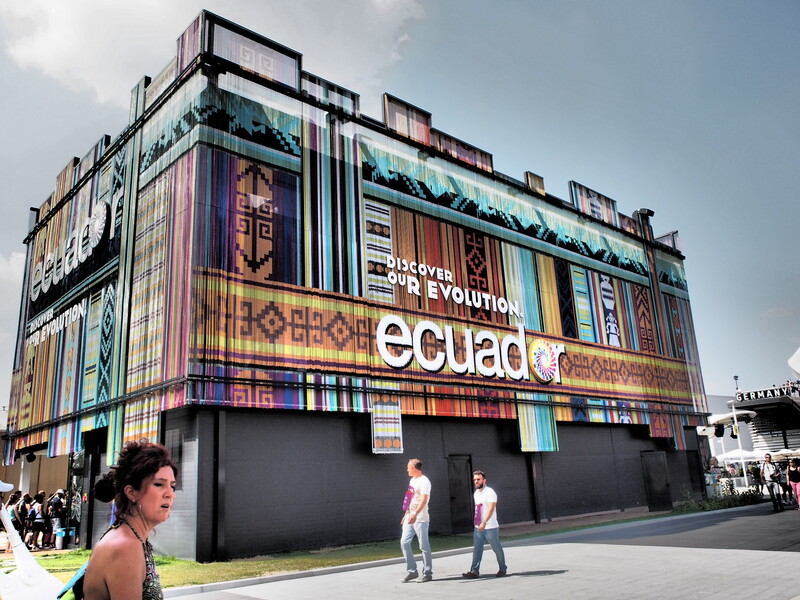 Nura: Yeah, but I do believe that is not the interest of anyone, talking about politics, I mean the real changes, the cultural changes – I mean the only place I saw the word “Revolution” was the pavilion of Ecuador, who uses it like a slogan. Like a tag-line just to impress people. Pascal: What does it say? Nura: Ecuador uses it like a tag-line. It’s the only thing political, but it’s fake, I mean it’s a tag-line, it’s just a commercial. It’s just for marketing, but I don’t believe that EXPO is made to cause a real change in our life. No. I think that it helps to move money, a lot, move business, a lot, and that’s the top of the pyramid-sight. But for us, for the people, we can gain a real political change, a real cultural change, because we are meeting each other and because we are having a real talk together. Because we are meeting and we are facing our different experiences and backgrounds through relationships. That’s the real revolution. Pascal: If EXPO is about moving money, isn’t it more profitable for bigger pavilions, like that of Israel than the smaller, the Cluster Pavilion, do they even gain anything out of it? Nura: No, for example the Israel Pavilion is about Propaganda so they are trying to publish humus and falafel like their own dishes, but it’s impossible that a land, who started just seventy years ago with settlements, could claim their food is seventy years old. I mean it’s quite impossible, it is paradoxical. I believe that with words you can build castles. I mean if you say it “Ok let’s say it”. But it’s not the reality. What is going to happen, if people are coming to our pavilion, is we push them so hard to travel through Palestine, so they can be the real media. They can be the real journalist and the real, main-character of their life. And this kind of experience affects all your friendships, all your relationships, and it starts to change the real state of facts. Nura: I mean, in my opinion, I decided to give up six months of my profession, just because I knew, I had the chance to meet a lot of people and try to encourage and affect them through emotions – I mean not like “You have to go”, it’s not like a duty but I’m trying sweetly and kindly to encourage them to come travel to Palestine. Because something really important to understand about humanity is about the future of humanity, of humankind. Pascal: What direction, do you think, this struggle will take in the future, the thing between Palestine and Israel? You think that there will be an agreement of some sort? Nura: I’m not sure, I have personal opinions, but I’m not a geopolitical but an artist person. I have personal views. Pascal: Pushing tourism though might be a good idea to further the knowledge about Palestine. Nura: Yeah. Because it is about communication, I mean, we are just, we are like children, starving. People now are so hungry of gossips, of bad news – we need them now. We’re drug addicted by gossips by bad news and we are completely indifferent, we have no more feelings about real bad news, because we have too many, this is the low of mass-media communication. Pascal: Yeah media communication seems to be at a low nowadays. Nura: Yeah, I mean there are big studies about, how to brainwash people, this is one of them – I mean “Israel – Land of tomorrow”, “Arid Zone Cluster” and these kind of things. This is brainwashing. So whenever you travel because you were born free and you have a head on your shoulders, a couple of arms, two legs to walk on your own and you find yourself lucky enough to travel, because you were born free, it’s a moral duty, just do it. Pascal: Yeah, if you have the money. Nura: The money still is an illusion, whenever you really want and need something you are going to achieve it, I’m sure. Pascal: Yeah, but I got your point in any case. A good one. Pascal: Do you think that the Palestine pavilion succeeds in the things you want to promote? Nura: I’ll be sure. I mean, I’ll be able to reply you, to answer you, in a few months, a year maybe, because I’ll see the results of our storytelling. Nowadays I just hope that people could feel less fear of travelling through Palestine, because mainly – you know – fear is like putting seeds through the wind, so easy. Fear is the first emotion/issue of people, because fear is the easier and harder feeling. I mean – it’s easy to feel fear, because we are human beings, the only thing that really stops us, is the fear of something and it’s the hardest because we are still children, we really never grow up for real. Even if we are in the middle of our adulthood, we still belong too much to the feardom, the kindgdom of fear. So first of all the thing is to speak nicely and try to have a real human connection to the people, so I don’t want people to feel judged by me, like “Oh, you don’t want to go to Palestine, you are such a mean person.” No. “If you don’t want to go to Palestine, lets understand why. So stop a little bit, I give you a bottle of water, just drink a little bit and listen to me, please. Because all the things you are listening to about Palestine – I’m just trying to help you of a big misunderstanding.” I don’t want it because it’s about humankind, it’s about us, it’s about human beings on the planet. So we are trying to connect with people really nicely, really kindly with no judgement. Nura: That’s all actually, because there is nothing to see in our pavilion, there is just a video, showing how business, how tourism, how cathedrals, architectural environment are made of. Which is very nice, it’s cute. But maybe it’d be better to give away for free a DVD of this movie for example. We have a guide, that unfortunately has not even a map of Palestine and we fight a lot between each other about this, because it seems like not facing a reality. Just face this conflict, just try to talk about this problem. Nura: Yeah, the real Palestinian map. Pascal: Has it been there since the beginning? Nura: No, I brought it from my fathers house. I brought this beautiful map of the real Palestine, of the actual Palestine , which shows the heritage of the embroidery for example or at least – which are the boarders of Palestine – of course, we have also a map of the occupied Palestine, which are the media boarders, which is called “West Bank” and “Gaza strip”. But I’m always, I always pay attention of helping people to find the differences between one another, to let them understand, how is the reality, how is the thing going on for real now, nowadays, okay. I’m not just pretending Israel is not existing, otherwise there wouldn’t be any war. I’m just trying to help people understand what are settlers, what are they doing to children and so on, but I’m not only talking about negative things. I’m talking about negative things after a long dialogue but first of all I am focusing myself towards the beauty of Palestine and history of Palestine. Pascal: Can you round up the interview with a sentence something you want to say at the end with regard to the things we talked about. Nura: I do believe in human relationships – first of all you need to ask the world, if the world wants to be changed – Second, things can change just through human relationships, close relationships, I mean if we – if we can take advantages of our emotional feelings and a close human connection, I have hope of me helping you or you helping me to change my point of view and help humankind, but just through human relationships – I do really believe in local things, local environment – not large, because there is too many people to listen to and because we are quite spoiled in our Western civilization, we speak up about anything, because we feel like we are the media and we have opinions on everything, even if we never read a book in our life. Since the social media started, we are feeling less alone, I think the other thing that we are fearing is not just about fear itself but about feeling lonely, so social media helps you to relieve a little bit of your pain and speak up more, so someone could listen to you. I’m so sorry about it, I’m really so sorry about us, because feeling lonely I know is sad, you can cry a lot, but social media unfortunately is not helping us for real of feeling less lonely, it’s just helping us to be connected, but not human related. I think that’s all. Pascal: Thank you very much for the interview.